We've been getting fantastic corn from the PB farmers market recently. When corn is at its best, it really doesn't matter what you have with it - the corn is the star of the show. The other day we rubbed a few ears with chile and cooked them on the grill. Simple, but perfect. As far as we are concerned that's the only way to eat corn. Sometimes after it comes off the grill we rub it with a lime and sprinkle it with some Queso Enchilado or Parmesan cheese. Or...do what the street cart vendors in Mexico do, slather it with mayonnaise then sprinkle on the cheese. Mmmm, I like the lime and salty cheese idea. 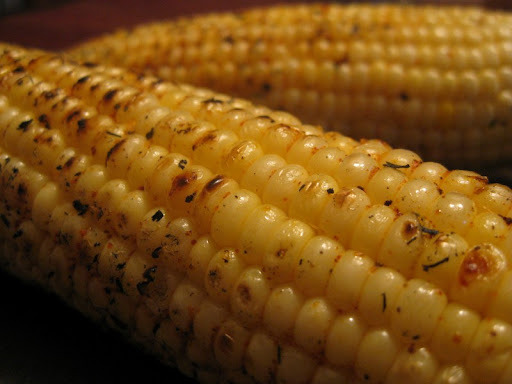 We've eaten that version of grilled corn in Mexico, but never here at home. Thanks for the reminder!